KIMCHIIIIII!!!! Who else is obsessed with this stuff?? It’s so amazingly crunchy, spicy, salty, savory, acidic, delicious, and makes the perfect addition to tons of foods. This compex condiment is a Korean favorite made of fermented spicy peppers and veggies, mostly napa cabbage. In Korea, it’s served with basically every meal, because it goes so well with everything of course. It’s especially delicious with rich and dense foods like meats and rice. Isn’t kimchi pretty salty though? Yes, it is pretty high in sodium as salt is used as part of the preservation process. This isn’t necessarily a negative though. Athletes are likely losing a good amount of sodium in their sweat through daily training or competition. While many people think sports drinks are the best way to replenish electrolytes, food is just as good a vehicle if not better, as it comes as more than just sugar water. Seasoned or naturally salty foods offer an excellent opportunity to replace electrolytes like sodium lost during exercise. What other kind of nutrition does this stuff have going on? Kimchi is a good pre- and probiotic too! Prebiotics are fiber-rich foods that provide nourishment for our beneficial gut microbes. Making sure all those bacteria are happy and thriving is pretty important to overall good health. Give them what they need with a diet rich in fiber from fruits, veggies, whole grains, legumes, nuts, and seeds. Probiotics are ‘good’ bacteria in our food that support our own microbe community when we eat them. Some delicious examples include yogurt, miso and kimchi! The fermentation process used to make these foods results in a healthy dose of beneficial bacteria. Back to this awesome pizza. It’s maybe the simplest thing I have made in a long while, but the combo is a whole lot more than the sum of its parts, believe me. 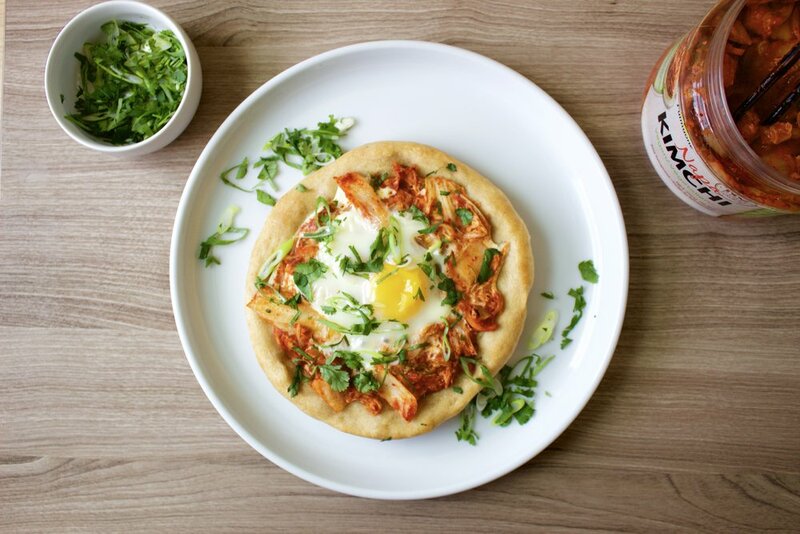 You have the rich, doughy, chewy, and slightly crisp pizza dough accented with the bright, crunchy, and spicy kimchi. The egg is like the cherry on top, but its an egg on top and it’s gooey and awesome and ties it all together in the most delicious way that eggs do. When should you eat this? Other than right now, this pizza would be a pretty special breakfast or brunch option. There is no problem with having it for lunch or dinner either of course. I will say that to make this part of a balanced meal, you are gonna need some extra protein on the side. This could be in the form of literally anything like chicken, fish, yogurt, etc. One egg has about 6g protein, which, I am sorry, is just not enough for athletes. Your muscles want more, so make sure you help them help you. However you make this part of your life, I hope you enjoy this ridiculously delicious pizza soon! Pre-heat oven to 400’F/200’C. Let pizza dough warm up to about room temperature. Lightly oil a small oven-proof pan (diameter about 8”/20cm). Stretch the pizza dough to the size of the pan. Place in the pan and lightly press down. Bake in the oven for 10 minutes. The dough should not be wet any more and look about half cooked. 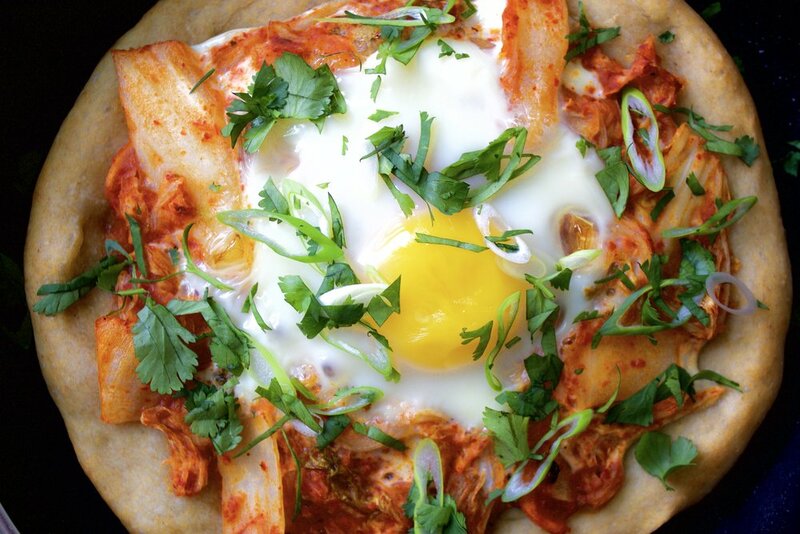 Arrange the kimchi on the pizza, leaving a small indent in the center. Crack egg into the center. Put back in the oven and bake another 5-10 minutes, until whites are set and yolk is still runny. Remove from oven and let cool for a minute before diving in. Top with fresh cilantro and scallion.